1.Please calibrate the PH meter before each use and clean it after using. 2.A correct reading could be selected when the change of value is less than 0.01ph in about 10 s.
1.Do not drop the entire TDS meter in water of dip beyond the maximum immersion level. 2.The TDS meter is not suitable for the liquid that are sloshing, heavily polluted and high temperature. 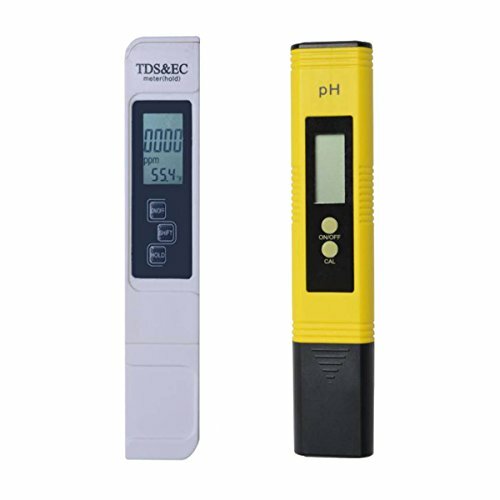 HIGH ACCURACY: PH meter resolution is 0.01pH, accuracy 0.01pH.TDS meter rangs 0~9999ppm, Conductivity 0~9999 us/cm, accuracy 2%. EASY TO USE: PH meter has AUTO CALIBRATION function, which means you needn't suffer from complicated calibration procession any more! TDS meter could hold the measruement data by the "Hold" button,and turn off automatically after five minutes of non-use. POCKET SIZE: Handheld design and small size make it convenient for you to carry it everywhere you want.The cases protect testers from sharp objects. WIDE APPLICATIONS: Great for water filters, food (vegetable, fruits) and drink quality monitoring, pools and spas, aquariums, hydroponics, etc. WHAT YOU GET: PH meter*1,TDS EC temperature meter*1,carrying case*2,PH buffer powder*2,30 days money back guarantee and 90 days worry-free service. If you have any questions about this product by ibdone, contact us by completing and submitting the form below. If you are looking for a specif part number, please include it with your message.